Since 1995 The Sweet Tomato Test Garden has continually tested new seed varieties, methods of growing tomatoes and products in our desert garden, always looking to improve the growing method, tomato quality and size of the harvest for desert gardeners. The combination of growing method and tomato variety I discovered now applies to the tomatoes we grow for our own table, my improved growing method is used for our trial tomato varieties. We assume; if our successful method does not produce lots of big tomatoes in our test beds then it is the fault of the tomato variety being unable to set in our desert heat. Yes, this is not very scientific and we have no microscopes or laboratory. What we do have is a continuous supply of big tomatoes during the summer. So, I leave it to the biologists and horticulturists to work this over. I am just a humble and former Master Gardener searching for ways all of us can grow lots of big tomatoes in the hot desert. 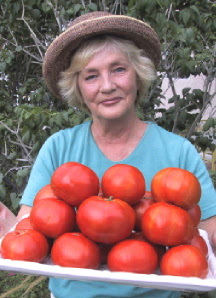 For the real scoop on growing tomatoes in the desert be sure to order my book, “Growing the Tomato in Las Vegas in Terrible Dirt and Desert Heat.” It was written after years of research and tells you what we finally found out to insure picking lots of tasty, big tomatoes in the hot desert. If you live in a similar climate much of what I do should apply to your garden. I you live in Las Vegas, or are visiting here, please stop by the Sweet Tomato Test Garden, but, please phone first, 702-490-5217. I don’t want to miss visiting with you. You may also stay at the Test Garden in our beautiful Guest House in the garden. Call me on my cell phone at 702-472-3258 for information on booking a reservation during your visit to Las Vegas. It is a very popular place to stay so I hope you will plan ahead to help insure that it is available for the dates you want. I would love to have you stay here. Located 20 minutes by car from the strip and/or the Las Vegas Convention Center in a country-like setting. 30 minutes to Red Rock Canyon and hiking. Walking distance to restaurants, supermarkets, casinos, theaters and Wal-Mart.